If you’re a business, you have customers. If you have customers, you want to keep them happy – because without them you have no business. Customer relationship management (CRM) is a way to use technology to make it easier for you to make your customers happy. A good CRM tool will manage your customer interactions by organizing, automating, and synchronizing the parts of your business that deal with customers –sales, marketing, customer service, and technical support. 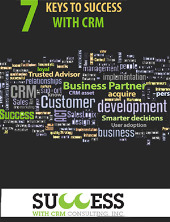 We like to say that a successful CRM Implementation is not a destination, it’s a journey. Complete the form on this page to download and read our ebook to find out more.